Do you think you know why people share your posts? How to fool search engines? How to leverage personal brands for business? How to manage a crisis? How to gain exposure by pretending to do good? Here are five posts to remind you why bullet points, best practice duplication, and pat answers are not the end-all to communication. They are only the beginning. 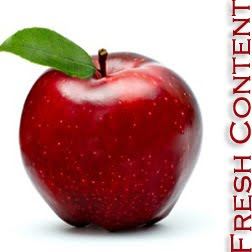 They also make up five timeless and compelling fresh content picks. • The Psychology of Influence and Sharing. John Bell believes that psychology is the next rediscovered territory for marketers, and he is right. (Whether marketers will truly understand psychology is a different question all together.) Inspired by new information from a column sharing a study by researchers from the University of Pennsylvania, Bell adds value to New York Times trends that suggest people tend to share positive, long-format, and challenging topic articles. • 3 Reasons PR & Communications Pros Need to Know SEO. Not many people know more about SEO than Lee Odden, which is why we were thrilled to see a shift in optimization thinking. With 91 percent of journalists, editors and reporters surveyed using standard search engines such as Google, Yahoo or Bing to do their jobs, Odden's three divisions of optimization can be summed up as considering people first. • Your Business Is Worthless if It Depends on You. • Brand Crisis: 10 Crisis Response Myths. Shel Holtz might have hated it, but Bob Conrad's post perfectly debunks patented assumptions often employed in modern crisis communication. Sure, using the proven points of crisis communication are worthwhile, but unless public relations practitioners are prepared to see how that stacks up in unique situations, the prescription might fail. My personal favorite among his points is number six. There is no one-size-fits-all approach to crisis management. • Authenticity in Corporate Social Responsibility. Corporate giving and strategic communication have been around a long time. What has changed, however, is the visibility of these various programs via social media. Geoff Livingston suggests companies might slow down before they turn otherwise good corporate citizen programs into thinly veiled marketing campaigns. Given that 90 percent of organizations cannot discern the difference between cause marketing and corporate social responsibility, he might be right. Since people first learned to speak, they have attempted to master the art and science of persuasion. Throughout history, new methods to manipulate, control, and manage information have always followed every single innovation designed to set it free. The adoption of social media is no different. Today, public relations professionals and communicators are tasked with balancing the opportunities that come with infinite reach as well as the new challenges it creates. Part of the job is to manage organizational communication; not with an intent to manipulate it, but to ensure misinformation doesn't overshadow the truth. 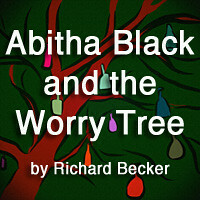 View more presentations from Rich Becker, Copywrite, Ink.. The above deck is one of the teaching tools I'm using this year for Writing For Public Relations at the University of Nevada, Las Vegas. The intent of this deck is to help students understand the opportunities for and threats to organizational communication in the modern world. Enjoy. Exploring Validation: Do We Need It? Dr. Satoshi Kanazawa, an evolutionary psychologist at the London School of Economics, can be considered a colorful thinker of sorts. He has argued that Asian cultural traditions inhibit Asian scientific creativity; poor health in some countries is related to lower IQ and not poverty; and that beautiful people are 26 percent less likely to have male offspring. On more than one occasion, his conclusions have been wrong. And yet, there is some buzz over his new theory, published in Social Psychology Quarterly, that liberals and atheists are more intelligent — here, here, here, and more than two dozen others. Why? He believes it. And others want to believe it too. Most recently, U.S. Sen. Harry Reid claimed on the Senate floor that "women aren't abusive, most of the time. Men, when they're out of work, tend to become abusive." There are more than 16 groups calling for him to issue an apology for misrepresenting 250 scholarly studies. Why? Brian Solis writes about a similar phenomenon. He calls it the Verizon Network Theory, which suggests that we gain confidence with online interaction, reinforced by updates, followers, retweets, etc. In sum, people seek out validation and hope for validation on the Internet. He cites several surveys that demonstrate it, with a growing percentage of the population wanting to be noticed. Why? Understanding the increasing need for validation. With increasing regularity, people are seeking out sources that validate their beliefs. Kanazawa seems to do it with research, which is readily lifted up by people who want to believe in it. U.S. Sen. Harry Reid did it, which reinforces his erroneous gender stereotypes. And Solis is right that people lean toward validation activities online (and, increasingly so, offline too). You can see some similarities in Robert Cialdini's book, Influence: The Psychology of Persuasion, which Fortune Magazine lists among the “75 Smartest Business Books.” In it, Cialdini centers his idea on six key points that we also see in social media. • Reciprocation. People are likely to share information from people who have shared their information. • Credibility. Although nowadays, online, credibility is associated with popularity over expertise. • Friendship. Salespeople have always understood that people tend to buy from people they like. • Scarcity. Items with a perceived scarcity have greater value. Online, this amounts to a number of followers. • Social validation. People are predisposed to follow the majorities rather than minorities. • Commitment. Once people are engaged, they tend to become more brand loyal over time. But the question that needs to be asked is: given the increasing regularity of misinformation and the proliferation of self-validated theories, is this increasing need for self and social validation a good thing? 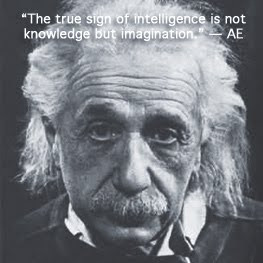 Albert Einstein, IQ estimated at 160-180, didn't think so. Credit Suisse Research Institute, which identifies and provides insights on global themes and trends for Credit Suisse AG, released an in-depth analysis of how a company's brand can be one of the few true competitive advantages remaining in modern industry. The study focuses on industry and company conditions that are vital for brand success as well as a model for brand lifecycle that suggests key entry and exit points for investors. "We believe a strong brand is one of the most powerful and sustainable advantages a company can have, but one that is often ignored by the financial markets," said Omar Saad, director at Credit Suisse. "We believe brand stocks will continue to outperform the market, and our proprietary framework analyzes brand lifecycles to determine how and when to invest in brands for optimal returns." Key Findings From "Great Brands of Tomorrow." • Stronger brands consistently generate out-sized long-term growth and returns for shareholders. Companies that invest at least two percent of sales revenue on marketing outperform the S&P 500 by more than four percent annually. The top one-fifth of strongly branded companies outperform the market by 17 percent. • Some industries are more brand friendly than others. The study demonstrates that brand power is strongest in industries that have the closest proximity to the customer. This suggests that even B2B companies benefit from some direct-to-public communication. The study also demonstrates that reputation is one of the most important roles in customer purchasing decisions. • Most brands follow a sustained arc with five distinct stages. These stages include: emerge, hit the wall, transform/proliferate, dominate, and reinvent. For investors, this means spotting companies that transform from a niche player into a powerful brand that can be proliferated across new markets and categories. 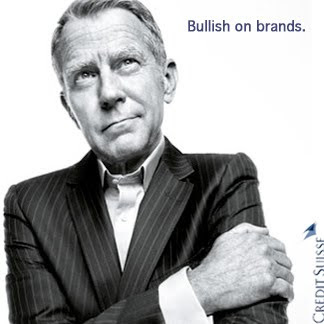 • Tough financial times are often the most opportunistic backdrops for great brand companies. As weaker competitors scale back and new entrants delay riskier plans, strongly branded companies emerge out of a weakened economy and outperform the market by as much as 18 percent within the first six quarters of recovery. According to Credit Suisse Research Institute, brand stocks are already beginning to outperform their markets by seven percent since March 2009. In addition to its report, which identifies brands and their relationship to the market, Credit Suisse released a list of 27 brands that it believes will outperform based on their brand advantage. They include: Alibaba.com, Almarai, Amazon, Apple, BIM, Capitec, China Merchants Bank, Commercial Aircraft Corporation of China, Enfamil, Facebook, Hyundai Motor, Indian Hotels, Julius Baer, Li Ning, Mahindra & Mahindra, MercadoLibre, Mercedes-Benz, Polo Ralph Lauren, Sonova Holding, Swatch, Tiffany & Co., Tingyi, Trader Joe's, Tsingtao Brewery, Under Armour, Uniglo, and Yakult Honsha. 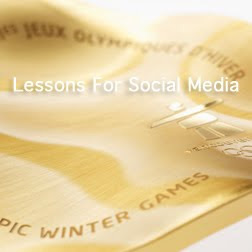 Social media experts, social network managers, and bloggers could learn something from the 2010 Winter Olympics in Vancouver. There are 2,636 athletes from 76 countries competing in 15 sports, which have additional variations in form and technique. All of these athletes are different. Each and everyone of them has a different attitude, approach, skill, technique, style, and degree of teamwork. And yet, they share a common bond in that they all represent the best of the best in winter sports. So does social media. Every time I read a well-meant post about how social media should be approached, I cringe a little bit. Should doesn't really have a place in communication, let alone social media. In an environment where more than 69 million people might define social media as playing Farmville, who's to say what should or should not be done? Either it works or it doesn't. How To Win Online Like An Olympian. Can you imagine what might happen if figure skaters approached pairs like ice hockey? I doubt Shen Xue and Zhao Hongbo of China would not have taken home the gold in figure skating pairs for a body check. I also doubt that Jarome Iginla of Canada dreams of a reverse rotational lift with Alex Ovechkin from Russia. Social media is much like that. Different niches develop their own sense of the sport. Foodie bloggers and mommy bloggers are different from business bloggers and communication bloggers (though some blend the elements). Even in communication, there are variations. Advertising, public relations, marketing, social media, and communication education all approach social media differently (and the best of them tend to manage client social media efforts differently too). Not everyone believed that Evan Lysacek from the United States could win gold without the all-important quadruple jump. He did. Lysacek edged out Yevgeni Plushenko from Russia with an overall routine featuring better jumps, spins, and footwork. Meanwhile, Daisuke Takahashi from Japan employed a much more playful style to win bronze. Social media is much like that. Long format or short format, lists or no lists, personal or formal, pictures or no pictures, comments or no comments, video or no video — all of it is as diversified as various sports. What really matters is that any individual blog or online community excel at whatever sport it might be similar to. In the Olympics, not every team is the same. It takes a different kind of team to be part of a four-man blobsled than it does to play hockey. Scott Moir and Tessa Virtue had to consider each other's strengths to win gold in figure skating pairs. Shaun White didn't have any partner limitations in landing a gravity-defying double McTwist 1260 in snowboarding. Social media is much like that. One of the things that Forrester Research did was reconsider how it views the team. Holtz doesn't have any such limitation. He is an all star, even when he plays for a team. Seth Godin has a different style too, one that is much more independent and isolated. Yet, it works for the people who read his books and blog. Apolo Anton Ohno is one of the most popular Olympians on Twitter, with almost six times the followers of Lysacek. Does that mean Lysacek might consider giving up his gold medal figure skating success in favor of the short track? Does it mean he is less of an Olympian? That would be silly to think so. And yet, it's not so silly to some people in social media who adopt a prevailing thought among communication bloggers. Some are torn between being more conversational or controversial because their colleagues seem more popular. The truth is that their comparison neglects that they might be in a different sport with a different style and a different team approach. When bloggers align themselves with what the most popular people are doing based on perceived success, they've lost. In most cases, with some exceptions, the most popular reach a perceived success by knowing what sport, game, and team approach they want to take. And then, they play it perfectly. Sure, some copycats can duplicate what those who came before them did. (It's very simple to do in social media circles, if all you care about is numbers.) But they will never quite measure up with compelling ideas because they are trying to be something they are not. So, popularity aside, maybe people ought to do what works for them or their organizations. After all, the best sky jumpers don't dream of being figure skaters, they set their sights on being the best jumpers that they can be. How about you? Do you feel a disconnect with the sport you chose because it's less popular, flashy, or self-reliant? Don't be. Just be the best you can be. Or, if you're working in social media for an organization, make it the best it can be. This is how I've come to view the Forrester Research policy change and the conversation that lingers on. Forrester Research is trying to be the best it can be. And when you look at the Forrester Research case without the emotive buzz of taking something away from all-star analysts, then you realize Forrester didn't change sports. What it changed was the team approach and style of play. Instead of picking star players from NHL teams, Forrester wants to play like the Herb Brooks' 1980 Miracle team. Does it matter? It doesn't matter if they continue to score shots for their clients. Conversely, it might matter if individual players feel less empowered to take opportunity shots that still score for the team. Time will tell. By now, you may have heard about the viral video, Coca-Cola "Happiness Machine," on YouTube that generated 1.5 million views in about a month. Some pros keep asking me how they hit 1.5 million views, but they're asking the wrong question. Even reading the write up by Christine Kent doesn't tell the full story. Atlanta-based interactive agency Definition 6 shares its tactical and technical goals, and reveals that neither Definition 6 nor Coca-Cola pushed the production with a publicity campaign (an all-too-tempting component of anxious agencies and clients). They let their considerable fan base find the video and share it on their own. Coca-Cola's "Happiness Machine" Celebrates The Brand Relationship. The video works. It doesn't focus exclusively on the product (it even shares non-Coke products). It doesn't center on customers or demographic examples (as many social media proponents claim). Instead, it focuses on the relationship between the product and the customers, and what happens when the two come together, underscored by the social aspects — sharing Coke — between friends in a setting where spontaneity is a welcome distraction. Two weeks ago, I shared a presentation that discusses the elements of great writing, with an emphasis on how communication needs to be accurate, clear, concise, human, and conspicuous. The Coca-Cola video hits all of these elements, effortlessly, without the need for a script beyond the concept. It also captures many of the elements that make up news — stories that people need to share. Sure, not every company packs the power of the Coca-Cola brand nor is every brand relationship a celebration. But that is part of crafting the right message for the right audience. You have to consider every strength that can be conveyed within the context of a single memorable message. Running two minutes in length, the Coca-Cola video does something else too. It demonstrates that advertising can easily adapt to an online environment. It might require thinking different, but that is part of the profession. Virtually every wildly successful advertisement in history broke more conventions than they followed. And that's not by accident. The Pew Internet & American Life Project released its fourth Internet expert study on Friday. The Future of the Internet IV compiles survey responses from almost 900 prominent scientists, business leaders, consultants, writers, and technology developers around five key Internet related topics. The five topics included (paraphrased): the value of online content, the impact on the written language, the extent to which innovation can be predicted, the freedom of access and information, and the protection of privacy. The value of online information. • 76 percent believe more information leads to smarter people who make better choices. • 21 percent believe the Internet could be lowering the IQs of the people who use it. The discussion, spurred by Nicholas Carr, is underpinned by the thought that people are moving away from a meditative or contemplative intelligence and toward a utilitarian intelligence. (The price of zipping among lots of bits of information is a loss of depth in our thinking, he says.) There is some truth to the argument, with content being distilled into little nuggets of easily accessed information (sometimes incorrect information). Many arguments against the idea suggest the Internet will change cognitive capacities so people won’t have to remember as much, but will have to have better critical thinking and analytical skills. It seems that any real direction has yet to be set. With the emphasis on short popular content, the depth and accuracy of information has diminished. However, this seems to be a short-term problem as objective human editors may eventually have a role in vetting information on the net much like yellow journalism gave rise to objective journalism around the 1920s. Of course, Gordon Lightfoot might have a different view. *Amazingly, many newspaper headlines have actually sold this portion of the study as evidence that the Internet makes us smarter, which makes us wonder if anyone read it. The Internet enhances reading, writing, and knowledge. • 65 percent believe the Internet has enhanced reading, writing, and the rendering of knowledge. • 32 percent believe the Internet has endangered reading, writing, and intelligent rendering of knowledge. Almost all of the survey respondents seem to agree that the written language is suffering as a result of online communication. However, how the two sides frame the outcome is where they part company. Some suggest language is shifting to be more visual and/or simply different with communication becoming more fluid (but not necessarily better written). Without question, the acceleration of communication, quantity of communication, and format of communication tend to have consequences. The quality of the communication is often diminished. However, long-time content creators consistently suggest that their writing has improved as a result. It could be that the Internet has simply invited more people who would otherwise not write to write more often, which means the abuse of the language is short term or format related. Time will tell. The hottest gadgets of the next decade are already evident today. • 17 percent believe that the applications of tomorrow will not take people by surprise. • 80 percent believe that the applications of tomorrow cannot be anticipated today. With rare exception, almost everyone agrees that predicting future technologies beyond broad conceptual thinking is futile. Nobody can accurately guess what the breakout applications and gadgets will be by the year 2020. Only a handful believe that trend spotting provides an accurate glimpse of the future. Given the advancements over the last 20 years, it seems likely that innovation will follow two paths. There are innovators who enhance existing models, making them more efficient. And then there are innovators who create disruptive leaps forward that undo those enhancements. For example, Photoshop recently celebrated its 20th anniversary. Few predicted the explosive growth of Facebook. The Internet will be dominated by an end-to-end principle. • 61 percent believe there will be minimal restrictions over online access and information. • 33 percent believe there will intermediary institutions that control significant amounts of content. While most believe that public pressure will keep the Internet mostly free, the public will only succeed if they remain vigilant in guarding against government and network takeovers. Pessimistic views point to China and even the United States. In the U.S., the net neutrality debate has only temporarily restrained cable and telcos from exerting centralized control. With the exception of government intervention (which varies by country), scalability and scarcity will likely be the deciding factors of whether the Internet remains free as people see it today. Mass content creators, not distributors, will likely be those who determine to what extent information and content remain accessible. With more publications attempting to return to subscriber-based content, this stands to be the more viable threat to limiting communication. The future of online anonymity will evaporate. • 41 percent believe there will be tighter, more formal controls over the Internet, including scanning devices. • 55 percent believe it will be relatively easy to remain anonymous without public disclosure. There is greater and increasing pressure for authentication online. Ironically, proponents of an authenticated world do not always appreciate the severity of privacy abuses nor how such a move hinders concepts such as freedom of speech. The minor majority believes the Internet is well past a need for authentication. The reality is that online privacy is collapsing under the weight of uncoordinated, unrelated, and unlikely allies. There is pressure from communicators who chastise anonymity, pressure from governments and businesses to investigate dissent, and a general willingness of the public to surrender privacy for the smallest of carrots. The question is not whether online privacy will no longer exist, but when and to what extent. The full study, The Future of the Internet IV, can be found at the Pew Internet & American Life Project. The project is supported by the Pew Research Center, which is a nonpartisan "fact tank" that provides information on the issues, attitudes and trends shaping America and the world. Communication is in a constant state of change. The tools are different. The news is different. 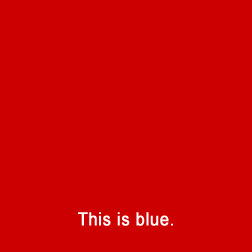 How we find out about something is different. Even approaching blog content is different than it was a few years ago, given the impact of social networks. But with all that is different, some things are even more different than we imagine and other things are surprisingly the same. 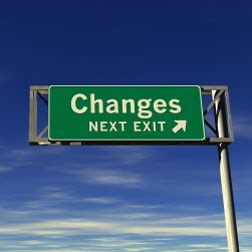 The challenge for communicators is to give up on one thing they've relied on for the better part of 20 years. Assumptions. • The Future Journalist: Thoughts from Two Generations. Sree Sreenivasan, professor and dean of student affairs at Columbia Journalism School, paints a picture of what new skill sets young journalists need to develop in order to keep up with the evolution of online media. At the same time, Sreenivasan underscores that fundamental skill sets are still critical in a changing profession: great reporting, great writing, ethics, specialization, investigation, and news judgement. • Cleveland Cavaliers “Watergate” May Be Dumbest Business/PR Move Ever. Sometimes people say that having fewer journalists to vet information is a good thing. I don't agree. Left to their own devices, organizations are sometimes tempted to present revenue generating schemes into a public service story much like the Cavaliers did when they shut off water fountains. Bill Sledzik rightly calls it like he sees it. • 2010 MarketingSherpa Social Media Marketing Guide. By combining several studies, Brian Solis offers up a comprehensive snapshot of the world through the lens of the Internet. Within each country profiles, there are dramatic and subtle differences in how social media is employed by different countries and cultures. For example, the United States is much more passive about content creation on blogs than China. Expect all of it to change again. Valeria Maltoni reveals that the buzz of adding value is only one part of the social media equation. When all content creators attempt to out value each other, nobody wins. To build a platform (or community), communicators need to consider how they can help other people's ideas, especially customers, shine as much as their own. Considering how great communicators of the past might approach social media has been a fun and worthwhile mechanism for many writers, bloggers, and journalists. Amber Naslund chose the right one by applying the finer points of Albert Einstein to social media. As a scientist, he was consistent in presenting his ideas in a clear, concise, accurate manner. As a human being, he married intellect with wisdom. Amazingly, wisdom remains constant. I never learned how to pitch a story like a public relations professional. I learned the hard way, sending query letters to editors in the hope of an assignment. Sometimes the letter was more important than a contract. Without one, it was harder to secure interviews. And even with one, you knew the story had to be good. Stories written on speculation were only bought if they were really good or great. If they weren't bought, you would have to rework the story and try to peddle it elsewhere. If they were great, editors were very open for more. 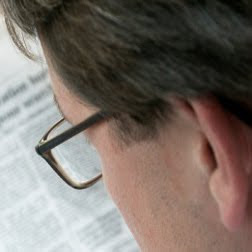 When I was asked to write my first news release, it never occurred to me to write one much differently than a news or feature story (with the exception of following an inverted pyramid lead for those familiar with the term). Writing format aside, I always believed that if editors paid writers for news stories then there was a chance they would accept some for free. The above deck is one of the teaching tools I'm using this year for Writing For Public Relations at the University of Nevada, Las Vegas. The intent is to teach students how to find news within their organizations rather than resort to pitching into the wind. Enjoy. Almost everyone involved with online content creation knows it. 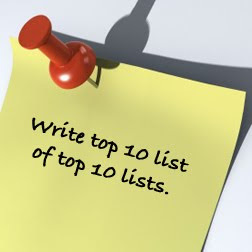 Lists can be powerful tools for traffic attraction. Search for "3 tips" on Google and it will return 80 million results. Type in "5 tips" for 74 million. Ten tips returns 84 million. So on and so forth. Okay, people like lists. So what? Lists can be excellent resources, which is why we like them. But lists can also interfere with retention. 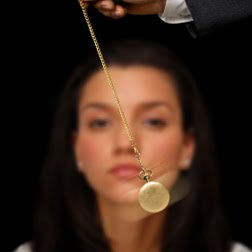 In fact, most memory studies conducted by psychologists reveal that the power to retrieve information from our memories decreases with every new bullet item associated with those clues. • The banker was asked to address the crowd. • The banker broke the bottle. • The banker did not delay the ship. • The lawyer realized the seam was split. • The lawyer painted an old barn. When the participants were tested later, they took longer to remember any facts about the banker. Subsequent studies demonstrated that the more facts provided about someone or something, the less likely they were to retain facts unless those facts were well organized and grouped together to form other associations. For example, if all the banker facts were related to a ship and all the lawyer facts were related to a barn, participants had no trouble retrieving facts about the banker or lawyer. Why? Because the lists were effectively reduced to manageable memories. The link to retention becomes: banker + ship: three details; lawyer + barn: two details. It becomes a powerful memory. Think about how this applies to branding. In Tiger Woods' statement today, media headlines focused on that he admitted to having affairs and apologized. Afterward, the stories all opined whether or not the apology should be accepted. 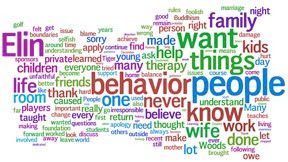 On the other hand, a word cloud reveals his focus was on his wife, family, friends, and children as it relates to his behavior. So why didn't most media pick up on these central points? In looking at the full transcript, the organization of his apology was muddled, leaving the media construct simpler associations that set the tone for the apology regardless of what Woods said. For most people, they are more likely to remember the news snip than the statement. Think about the last few posts or news stories you read that contained a list. Can you remember most of the bulleted items? Probably not. More than likely, unlike posts that tell a story or have one central theme, you might remember the topic but none of the details. The good news for the list builder is that people will have to revisit the site to retrieve the information again. The bad news for readers is that the lessons and the author are less likely to be remembered over the long term. This doesn't just apply to posts. It applies to education in general. In my course material on writing, students frequently tell me that they are more successful retaining my five elements on writing and Ike Pigott's three element on writing than those offered by Don Gale or Ogilvy and Mather. Although all of the four sets lend value, the difference is in the presentation. Pigott links three frequently associated attributes to his writing, underscored by a kung fu analogy. I employ organized association, reinforcing those points with alliteration. Why is it important? It's important for bloggers and journalists because while increasing retention might not spike traffic, it will help readers retain information and associate the content with you. Otherwise, they will be more likely to forget the content and the source, eventually conducting a new search based on the headline they remember. Will they find your post again? Maybe. In closing, I'm adding a related psychology study to my watch list. Richard Elliot Wener, professor of environmental psychology at Polytechnic Institute of New York University, is studying whether highly visible recycling bins remind people to not only recycle but to also be more environmentally conscious in general. How it that related? The study might have findings that cross over into understanding organized associated content, and whether those associations affect behavior. "The consumer isn't a moron; she is your wife." — David Ogilvy. The classic quote from David Ogilvy couldn't be more true today. One study, from the Boston Consulting Group (BCG), concluded that women drive $12 trillion in global spending today, which is more than 70 percent of consumer dollars worldwide. The study also estimates that women will contribute an incremental $5 trillion in earnings over the next five years. • 88 percent say they have responsibility for grocery shopping. 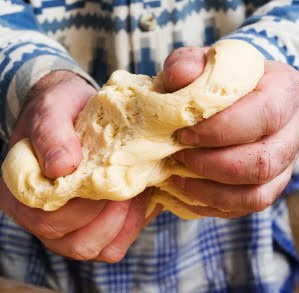 • 85 percent have responsibility for meal preparation. 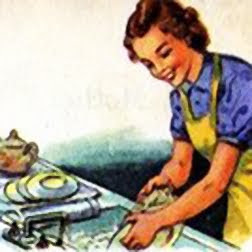 • 84 percent have responsibility for laundry. • 84 percent have responsibility for cleaning. • 77 percent have responsibility for household administration. The Economic Shift Toward Women. • 70 percent of mothers are already working. • 57 percent of college students are women in the U.S. (55 percent in Europe). • 40 percent of businesses in the U.S. are owned or co-owned by women. • 72 percent of consumer spending will be controlled by women in 2028. • Solely-owned women-owned businesses grow twice as fast as men-owned businesses. But we're not talking about stereotype reinforcement, which tends to affect both genders. We're talking about messages that don't meet the general needs of the decision maker. "Companies are failing to meet the needs of women in five key ways," said Michael J. Silverstein, BCG senior partner and coauthor of Women Want More. "Poor product design and customization for women; clumsy sales and marketing; inability to address the need for time-saving solutions; inability to provide a meaningful hook and differentiation, and failure to develop community." Lynn Truong, sales director of Wise Bread, recently published a post on American Express OPEN Forum that highlights a few suggestions, with the the very first tip reminding marketers that women don't always gravitate to pink. More compelling than dissuading advertisers from painting the world pink, Truong reminds marketers that women are not part of the same audience, simply because they share the same gender. It's a good lesson that goes beyond gender lines because in the quest to capture larger audiences, some advertisers lump too many different people into the same pool. We can no longer afford to think that men come from Mars and women come from Venus. Not only do both genders come from those planets, some come from Jupiter, Saturn, and Mercury too. Or, to end where we began: The consumer isn't a moron; she is your wife, co-worker, client, and boss. Something happens when you integrate strategic communication into organizational communication. Public relations is set free to do what it does best. Advertising is set free to do what it does best. And communication becomes more fluid between the various departments. That is not to say that a communication-driven social media program is the end all to integrating social communication. Like the public relations-driven and advertising-driven models shared earlier, models tend to be the beginning of developing an integrated communication program and not the end. This is one solution among dozens. The above illustration (larger version here) represents what a strategic communication-driven communication plan might look as it relates to social media. In this model, advertising manages advertising functions and public relations manages public relations functions. Social media is managed by a corporate communication department (or a similar department), with support from advertising and public relations. For simplicity, we've broken it down into primary functions for each. Shared functions are noted, but not broken out this time. • Maintain, manage, and promote the organization's blog or two-way communication assets on a Web site. This would also include market intelligence (which is shared with the advertising and public relations team), but primarily consists of content development and content distribution that adds value for customers. 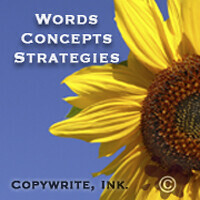 While blogs are presentation oriented, they do provide for two-way communication. • Maintain, manage, and develop the organization's social networks. This includes online programs and information sharing that nurtures true engagement and two-way communication in real time. Where advertising plays a role is that most social networks provide vehicles for advertising. If someone doesn't think online ads work, they are either delusional or have bad ads. • Blogger outreach occurs directly and indirectly as bloggers may source content from the organization's blog or develop relationships with the social media team via any number of social networks. Advertising supports this effort with media buys based on recommendations form the social media team. Public relations supports this effort as part of its media relations component. • There are some additional responsibilities, including: managing internal communication (with support from human resources), working with executive team members and marketing in development of a core message system or strategic communication plan, assisting executives who choose to be part of the external communication equation, and listening. • Managing media relations, which includes press releases, interview pitches, and demonstrations. The function is designed to generate increased exposure. It's mostly one-way communication with journalists vetting information, tailoring content to meet the needs of their readers, and arranging for opinion-editorial pieces. • Public outreach, which includes programs and communication materials for special publics (e.g., associations, special interest groups, unions, etc.) 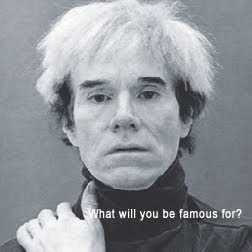 as well as direct-to-public communication and/or publicity. It's mostly one-way communication, with group leaders providing some two-way communication to specific members. • Blogger outreach, which includes adding popular bloggers within the media relations mix. Or, it could include bloggers who have been referred by the corporate communication team because they have special needs that are similar to journalists (such as requesting specific interviews, etc.). Public relations can also track cross-over professionals: journalists who blog and bloggers who accept freelance assignments. • Bringing public relations back to one of its core functions would certainly be an asset. Since public relations is not strapped with the daily operations of real-time communication, it could invest more time strengthening relationships between the organization and various publics by researching trends in the environments where the company operates. There is simply not enough of this work being done at some firms. • While Web sites are sometimes lumped into online mass media categories, the online environment has changed. One-dimensional, one-way static communication can only exist as an option for the most passive visitors. Social media can help make them consumer functional, but some elements clearly fall within the expertise of advertising as mentioned before. • Likewise, social networks do not exist in a vacuum. They work better with mass media support, targeted advertising, and communication supplements that span audio, video, and other components. Such support can mean the difference between staffing a "voice" on a Twitter (like Southwest Air seemed to have done given its Silent Bob crisis) and communicating with the public and the organization in such a way that a bad policy can change. • Managing traditional mass communication, which includes collateral, print, and broadcast. As long as there is mass media, even if it continues to serves smaller niches, the functions remain the same. What is different is that all of this communication has the additional role of helping consumers find two-way communication portals. There are also new distribution points online. • Promotions, which include direct response campaigns, guerilla marketing, and special events (sometimes managed by public relations), post-purchase communication is managed by the team. Sure, some is interruption based. But, as noted before, interruption-based communication is likely to continue as long as people respond to it. In summation, this model represents an approach to communication that delivers maximum impact with minimal means. It is designed to bring the organization and (optionally) its leadership closer to the public. It considers all publics, including internal stakeholders and draws on support from human resources. The end result of an integrated strategy allows corporate communication to directly communicate with internal and external publics within the context of an organization's mission, vision, and values. At the same time, it creates a two-way communication loop that expedites solutions when the communication is not aligned with delivery of the product or service. As with all of the integrated models we've shared, it helps establish consistent communication, multiple distribution points, multiple points of verification and validation, and more two-way communication outlets with the public. It also empowers employees (without obligation) to feel informed enough about the company that they can answer questions within their individual personal networks. Do keep in mind that social media fits differently for different companies. 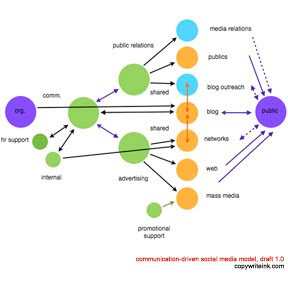 In this model, social media could maintain autonomous distinction and report to corporate communication just as easily as being performed by it, provided it doesn't create an unnecessary layer or continue to nurture silos (departments that operate with little interaction). I'm writing today's post poolside in Las Vegas. And Las Vegas, in case you don't know, is only a few miles from the West Virginia border. The weather here is a balmy 100 degrees and the water is a cool 72, just cold enough to preserve the crispness of my locally brewed Fosters Lager. You know, it's the kind of day that makes you wonder why Susan Boyle would have ever left her Las Vegas hometown to become a famous singer in the United Kingdom. We all miss her so much. My parents used to eat cactus cobbler pie with her on their front porch, mostly to get a better view of the kangaroos that roam wild here. Susan Boyle is not from Las Vegas, you say? Las Vegas is nowhere close to West Virginia? Kangaroos are not native to Nevada? Well, never mind all that because this post was going to be about unemployment so the rest of the content is relative. To someone in China, Nevada might as well border West Virginia, Boyle ought to play Las Vegas, and kangaroos are close enough to burros for me to claim creative license. Besides, it would be a shame that any critics would correct me, detracting from the central and most important issue. You think? How A Lesson In Accuracy Amounts To A Lesson In Criticism. No, this isn't another post to pile on Susan Arbetter, a reporter for WCNY, who claimed accuracy was relative after Bill Sledzik, associate professor in the School of Journalism & Mass Communication at Kent State University, corrected a few errors in a post meant to promote her radio show on gas drilling and the budget deficit. After being called out, Arbetter offered up a slew of excuses and justifications on Sledzik's blog as well as her own. It's especially interesting to me because I had planned to underscore the importance of accuracy to my class the very next day. Specifically, I said to them, accuracy matters above all else. It is wisdom passed on to me by professor Jake Highton at the University of Nevada, Reno, almost 20 years ago. Still, while it's so very important, I think accuracy has been addressed well enough in the comments on Tough Sledding by Sledzik. Instead, I keep thinking about the other lesson to be learned. And I think, for journalists and anyone who writes direct-to-public content, it's an important one. We all make mistakes. And while some of us are not inclined to make them purposely as Arbetter seems to have done, it does demonstrate that how we handle our mistakes is often more telling than the mistakes. Sometimes, it pays to listen when someone points them out. Often, it pays to pause before flying off the handle. And almost always, it pays to lighten up. The better response from Arbetter would have been to thank Sledzik. She could have simply said "Gee, Bill, thanks so much." And then went on to explain how we all construct memories that may be one or two steps shy of the truth. Or perhaps, given the Rolling Rock error, that sometimes busy reporters add in color from erred online sources, and then accidentally reinforce those myths. Or maybe, she could have provided some semblance of whatever the truth might have been. The issue would have died right there as a win for everyone. It might have even read like a professional courtesy. Instead, the whole affair has led some people to wonder why Arbetter doth protest too much. Perhaps there is more prose filled in fiction to be found. I dunno. I didn't look. I've written before on how to manage criticism. And recently, Amber Nuslund offered her advice on when to take conversations private. And after reading this flare-up over accuracy, I might add one more to the five points in my old post. 6. Thank any critics who point out red devil’s food cake on your chin. It gives you an opportunity to wipe it away before it stains your shirt. After all, the reality of the situation is this: it wasn't Sledzik who did Arbetter a disservice as she claims. It was all those readers who may have cared about those errors, just not enough about Arbetter to let her know. Nope. Those folks just moved on, leaving the red devil’s food cake to spread and stain. *Just so there is no confusion, most of what I wrote in the opening paragraphs is not true. Heck, I don't even know if red devil’s food cake can stain a shirt. But what I do know, thanks to Bill, is not to put the owners of Eat ‘n Park on the spot for a beer." The assessment by Page comes out of an in-depth analysis of Internet merchandising on online shopping behavior presented by Cars.com at the National Automobile Dealers Association Convention & Expo. The study found that cars advertised with multiple photos, descriptive sales copy, and a competitive price capture more consumer interest. How much more? • Competitive prices received 191 percent more page views and 263 percent more contacts. • Pages with 11 or more photos received 175 percent more page views and 127 percent more contacts. • Certified manufacturer logos received 18 percent more views and 34 percent more contacts. Despite findings that tracked more than 230,000 listings over two years, 7 percent of dealerships list without a price, 13 percent without a photo, and 13 percent with no sales copy. Beyond cars, the study validates that consumers respond better to transparency — they require a more detailed account of the vehicle than if they were shopping for the vehicle in person. Of course, none of this counts for Toyota. 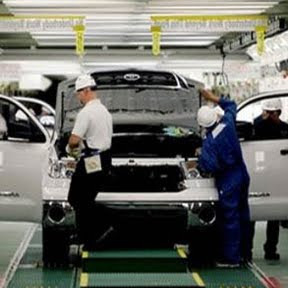 One survey shows that as many as 27 percent of would-be Toyota car purchasers will longer consider the manufacturer. This is six points lower than the initial recall. As mentioned last week, Toyota acted too fast in making promises for improvement. Specifically, it hadn't identified more problems across scores of vehicles. Most recently, Toyota recalled 8,000 Tacoma pickups due to possible cracks in a common drive shaft component. Its recall page now lists 12 models, dating back to as far as 2004. Yet, Toyota continues to run its Super Bowl advertisement that assures consumers that the recall is related to a slip in safety standards in recent days. If recent days is a relevant term, then Toyota's problems may have begun almost 2,000 days ago. Toyota is also running an aggressive Google campaign, with copy that undermines its own crisis efforts. The Google ad reads "Toyota takes care of its customers Read the FAQs at Toyota.com" despite mounting evidence to the contrary. There is increasing consumer and expert sentiment that suggests the crisis is becoming unrecoverable despite the recent pledge from Jim Lentz, president and COO of Toyota Motor Sales, U.S.A., Inc.
On a positive note, the company has adopted one of our suggestions: a top-to-bottom review of every process related to quality in design, production, sales and service. This should have been the direction that Toyota took on day one of the recall. Why the advertising message hasn't aligned itself with the pledge is anybody's guess. If there is a common theme for fresh picks in the first week of February, the theme seemed to be content. Specifically, content needs an assist to find its audience as much communicators need to maintain great content to keep a community. Given most social media budgets will be increasing this year, it stands to reason the volume of content will grow along with it. What is less understood is whether more communication means more clutter or whether quality content can cut through it. • Five Tips for Aspiring Internet Communicators. Geoff Livingston presents five lessons with links about being an Internet communicator. His list includes developing great writing skills, subject matter expertise, a passion for creativity, an other-centric world view, and a consistent presence. Within these content areas, Livingston lightly guides people with different skill sets to find their own paths. Cool stuff. • Content Needs To Get Most Of Your Attention. While content is important, Valeria Maltoni shares her insights on how it still needs to be part of an overall strategy. The tactics that grew out of her strategy include: lists, surveys, design, generosity, reciprocity, subscriptions, and search engines. But the real lesson here is that while these tactics help gain exposure, it is content that keeps people coming back for more. • CONTENT IS KING! LONG LIVE THE KING! Content might be king, but presentation matters. To prove his point, Ike Pigott stripped the design normally identified with his blog, effectively communicating more with a simple visual (or lack thereof) than with content alone. Presentation creates a very different experience. The addition of an Iron Chef plating analogy also lends itself to a perfect analogy. • Twitter Reveals iPad Sentiment. 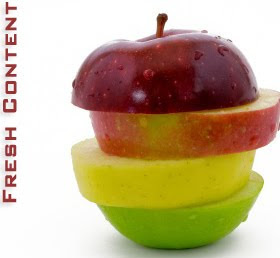 The intent of fresh content is to feature individuals over collectives, but sometimes content stands on it own. After reading (and hearing) scores of stories about negative iPad sentiment, MarketingProfs published research demonstrating that not all initial online reactions are suitable for long-term consideration. After two hours (and again after four days), iPad sentiment was significantly more positive than initially reported. For all the advantages of the Internet, the acceleration of communication, quantity of communication, and format of communication tends to have consequences. The quality of the communication is often diminished. While the challenge to be a better writer is not new, there does seem to be a growing sense of justification to burp out passionless news releases, let errors stand in social media, and defend made-up details as fact. Sure, we're all human. But what is the real cost of careless editing, writing, and reporting? Sometimes it spills forward. View more presentations from Copywrite, Ink.. The presentation above features a portion of my "On Writing And Editing" for the "Writing For Public Relations" course at University of Nevada, Las Vegas. In it, you'll find some modern tips and masterful thoughts on writing. Enjoy. Crafting Reality: Proficiency or Deficiency? Michael Josephson, president of the Josephson Institute, cited an interesting study that came out of the University of Toronto and the University of California, San Diego, late last year. The study found that while parents say that honesty is the best policy, they lie to their children in order to influence behavior and emotions. The researchers said they were surprised by how often what they call "parenting by lying" takes place, especially among those who most strongly promote the importance of honesty. I'm not surprised. In 1996, Bella DePaulo, Ph.D., a psychologist at the University of Virginia, asked 147 people between the ages of 18 and 71 keep a diary of all the falsehoods they told over the course of a week. They found most people lie as much as twice a day. This did not include mindless pleasantries or polite equivocations such as saying "you're fine" when you're obviously not. DePaulo's study is consistent with another study on lying conducted around 2004. They asked 30 students to keep track of their social communications for seven days, and those students admitted to lying about 1.6 times per day. The study also concluded people are more likely to lie on the phone, but only marginally so. And yet, another study on lying from the University of Arizona marked increases in children ages 6-8 and 9-11. The study breaks lying down into four categories: pro-social (protecting someone), self-enhancement (avoid embarrassment), selfish (conceal misdeeds at expense of others), and anti-social (hurting someone intentionally). Other studies, by the way, pinpoint that lying begins around three years of age. You get the point. People lie all the time. And they are obviously well practiced. What stood out to me in the post from the Josephson Institute, which develops services and materials to increase ethical competence, were three points (paraphrased below) I found useful as a future teaching model. • Risk Assessment. Is the benefit worth the risk, especially when the risk includes trust? • Alternative Action. Can you accomplish a goal another way, knowing that necessity isn’t fact but interpretation? • Long-term Consequences. Have you fully considered the consequences, especially if it puts others at risk or if it is exposed several months or years later. The reason this list is such an excellent teaching tool is that communicators are sometimes asked to lie for the organizations they serve. My advice, consistently, is not to do it. However, that sometimes leaves students at a loss of how to approach the subject. The first step in confronting a lie. Ethics suggest that when communicators become privy to mistruths, they address it with the responsible party first. This allows the responsible party an opportunity to correct it before turning to a higher authority. The imperative becomes helping the responsible party consider several points, much like those laid out by the Josephson Institute. Long-term consequences tend to be the most overlooked. Cutting corners to meet production demands at the expense of safety might not be noticeable until someone is injured. Padding departmental budget expenses over the course of several years can result in layoffs when the organization faces hard times. Attempting to be noble by padding scores in an awards contest may reinforce the winner's belief that inferior work is acceptable. Whatever the case, long-term consequences are not always known when people attempt to change perception. Interestingly enough, fear and narcissism tend to be the driving justifiers for lies. People who lie are afraid of the truth or, in some cases, believe that their direct manipulation of facts are necessary to produce a specific outcome. When you think about it, those traits are also why parents who place a honesty in high regard still lie to their children in order to change behavior. In closing, I might add that objective assessment and effective communication on the front end is a remedy as well. For instance, Gail Heyman, professor of psychology at UC San Diego, said telling a 2-year-old that you don't like their drawing is cruel. Therefore, such a pro-social lie is seen as somewhat justifiable. However, it seems to me that in such a case the error isn't the drawing as much as it assessment of the drawing (considering the artist is two years old) or the inability to communicate effectively, such as offering ways to improve the picture. This way, the parent won't hurt the child's self-esteem but won't enable them either. In other words, choose your words carefully. There are three ways to look at a brand new Butterfinger television commercial, which will begin to air nationally on Feb. 15 and continue through the third quarter: the celebration of consumer generated creative; the hyperbole of hype and hopeful publicity; or the gradual decline of advertising as we know it. The celebration of consumer generated creative. For the cost of $28, David Markus, a graduate of the University of Southern California's School of Cinematic Arts, won $25,000 and a one-year supply of Butterfinger candy bars. His spot is a mostly well-framed, cute, mildly funny iPhone app cliche. We don't want to take away from his win whatsoever. Congratulations. Customers can be creative. And sometimes they might surprise you, like fans of the television show Jericho, who out-marketed the CBS marketing team. Butterfinger was surprised too. It received 600 entries. Some, like this one or this one, aren't bad. Some are, but you can find those on your own. The hyperbole of hype and hopeful publicity. A few decent spots aside, the Butterfinger contest doesn't seem to be the success the company thought it would be. Of those 600 entries, Markus racked up 11,000 views on YouTube, which is far away ahead of the pack, including the contest promo. Most videos averaged about 100 views. On the Facebook/Yahoo video, views are higher with about 3,000 views as the average, which still seems low given the page has about 480,000 fans. Yet, to read the release, you would think the contest was entered by everyone on the planet. It's loaded with buzz words, such as allowing "fans to take control of the brand and express themselves in a very real way." Six hundred, anyway. "This approach essentially allowed consumers to talk to each other about the brand they love," said Daniel Jhung, Butterfinger marketing manager. "As a result, we got hundreds of new ideas with a wide range of creative interpretation and depth. The content laboratory is getting bigger and bigger." Maybe. The gradual decline of advertising as we know it. 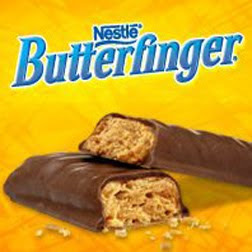 Again, this isn't meant to detract from any of Butterfinger's consumer generated marketing. I tend to be a fan of the general concept, and have managed a few in one form or another. But in reviewing the ads, even the decent ones, it seems to strike at the perception of what the general public thinks advertising is as opposed to what it can be. Sure, there are plenty of creative spots produced by agencies every year (we saw a handful during the Super Bowl), the concept of what makes advertising great is in steady decline. Even at some top ad shops, divergent thinking has somehow morphed into tossing spaghetti and hoping it sticks to the wall. Great advertising is hardly coming up with something witty or mildly funny or bizarre and tagging a three-second product shot at the end. It's hard work. It requires someone who can maximize creativity within the least creative of confines and still manage to produce something that connects with people in such a way that not only do they identify with the communication, recognize it as a conversation about what they were thinking anyway, and feel motivated enough to think about it, find out more about it, and maybe even go out and buy it. And therein might be why the Butterfinger contest seems one off from a real success story. A limited pool of people picked an advertisement they liked best. But what people "like" and what actually works outside of the context of a consumer contest is something else. And for students hoping to someday pursue the profession as a career, they might keep that in mind before adding to the pile of spots that leave people saying "I could write that ad" as opposed to "I wish I wrote that ad." "We are not eliminating any medical benefits," Rob Stillwell, spokesman for NV Energy, told the Las Vegas Review-Journal. "That's all I can say on the record." There is a reason NV Energy cannot discuss its decision to place a cap on contributions to employees' retiree medical plans: textbook public relations. Regulated companies are almost always silent in the midst of union contract negotiations. Some 200 union workers rallied in the rain yesterday to protest planned reduced health care benefits for NV Energy retirees and cutbacks in the utility company's work force. But the traditional pickets are only one piece of the union's communication program. 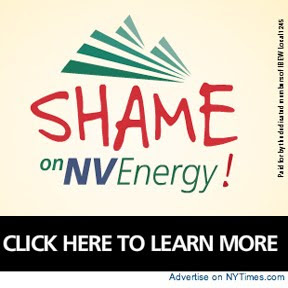 IBEW Local 1245 has launched a Web site and a Facebook page, aptly titled Shame On NV Energy. Paid advertisements help drive traffic to the site. Banners were placed on the The New York Times several days ago. It seems the communication is aimed at would-be investors considering the company after it reported a profit, credited to a 6.1 percent increase in Southern Nevada's general rates. Even without the rate hike, NV Energy was already delivering the most expensive energy in the mountain states. The union also seems especially irritated by the changes in retiree compensation plans because it was hopeful that NV Energy would be investing in a new transmission line and receiving $138 million in stimulus funds, which Senator Harry Reid claims as a feather in his cap. Instead, the union was surprised by a planned cut in retiree health benefits and the closure of offices in Las Vegas, Elko, Yerington and Carson City. The cuts are likely a consequence of NV Energy's planned move into renewable energy. In its most recent Integrated Resource Plan approved by the Public Utilities Commission of Nevada, NV Energy will be spending approximately $2 billion to purchase and invest in new renewable energy by 2015. The emphasis is on solar, wind, and geothermal. Recent announcements in its moves toward renewable energy all but drown out the union protest. However, that does not mean the complaints are falling on deaf ears. Since Monday, the Facebook account has tripled as consumers, concerned about energy prices, join the retirees. Like many utilities, the answer is never to reduce rates but to reduce consumption, they say. There is also speculation over the resignation of the company’s chief financial officer and treasurer just days before what would otherwise be good news. Speculation is commonplace, given the timing and lack of any specific reason. The story raises several interesting questions about social media and the current state of media. One of the most pressing has less to do with message management and more to do with message control, which social media is often credited in rectifying. However, in this case study, it seems social media makes communication a crapshoot. The success of IBEW communication relies on nothing more than drawing attention to the topic. The success of NV Energy communication seems much more to do with talking more about everything else, as there is no mention of cuts on its Web site or toe test on Twitter. "You're always hearing these very silly PR people when a crisis hits dive in front of the camera and dish out this ridiculous cliche that if you just fessed up, the problem would go away." — Eric Dezenhall, CEO of Dezenhall Resources. Two days after investing $3 million on a Super Bowl recall advertisement that flatlined with viewers who were using an online dial testing system to determine their level of interest, Toyota announced the recall of 437,000 Prius and other hybrid vehicles worldwide. It is yet another bump in a series of what the company has called a lapse in safety standards. Overall, Toyota has done a fine job managing most elements of its recall communication, including the development of a recall page on its Web site. One of the best elements includes videos that identify three problem areas that led to the recall and a detailed stopping procedure to minimize driver risk while they return their vehicles to the shop. Another bright spot is the Toyota recall plan. Within days, Toyota introduced a recall plan to notify owners, schedule an appointment with some dealers offering extended hours of operation, and reinforcement that some trained technicians are making repairs. The recall communication effectively focuses on what is important: identifying the problems, offering immediate solutions, outlining what owners need to do, stopping production until the problem is fixed, and providing updates on the repair status. This had led Eric Dezenhall, CEO of Dezenhall Resources, to conclude that the situation is manageable, even if the company didn't start well out of the gate. The problem many companies face, in part, he says, is that they communicate too fast. Another low point is the decision to cash in on the reputation of the company too early. Much like the Super Bowl ad, Toyota is delivering a message that claims for more than 50 years safety has been the highest priority. The advertisement then reveals that "in recent days" the company hasn't been living up to those standards. This recall communication focuses on accepting responsibility, admitting guilt, and promising to never let it happen again. Unfortunately, Toyota had not yet identified the extent of its recall. So as these messages move forward, additional recalls seems to contradict the message. This is the third time in recent months that Toyota has contradicted itself. This had led Gene Grabowski, chair of crisis and litigation practice at Levick Strategic Communications, to dub this recall as the worst handled in history because consumer anxiety persists and the messages have been mixed. The problem, in part, he says, is that Toyota was too slow in taking action. Like many recalls, the Toyota crisis plan has been a mixed bag. The truth is somewhere in between the assessments by Grabowski and Dezenhall. Dezenhall is right in that recalls are not all public relations. There are mechanical and operational considerations. Grabowski is right in that Toyota was too slow to take action with what is shaping up to be a slew of problems. The real damage to Toyota is impossible to assess at the moment. The number of recalls, especially those unrelated to the original problem, further erodes the company's credibility. 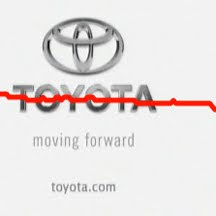 And with every new apology Toyota issues now, each subsequent apology means less and less. In this situation, Toyota would have been better served confining its initial communication to the recall at hand before accepting what seemed to be an across-the-board lapse in safety on one issue. Had they delayed an initial apology that isolated the problem to a single flaw, the company may have discovered there were several more recalls ahead and used the initial recall as a catalyst for investigating every detail. Specifically, Toyota could have used the "sticky pedal situation" as a catalyst for an investigation, and then breaking the news (as the result of that investigation) that safety standards were not being met across the board, including accelerator pedals, brake pedals, steering columns, and who knows what else. Meanwhile, instead of producing commercials attempting to cash in on the company's credibility bank, the crisis communication team ought to have been investigating exactly who knew what when so new stories do not undermine current efforts. For instance, breaking today, State Farm says it warned Toyota about an accelerator defect in 2007. We'll provide some crisis communication points as it pertains to this situation in days ahead, including on how this plan would differ from the introduction to crisis communication boiler plate. Otherwise, there seem to be only two factors saving Toyota at the moment. First, the problems did not result in an epic number of fatalities. Second, all automakers generate some negativity nowadays. How negative? Of all the manufacturers with ads that aired during the Super Bowl, only two vehicles weren't dialed down when the brand was first revealed in the commercial. Those two brands: Volkswagen and Kia. See for yourself.